We believe that a rota is about more than just getting a task done in the church - as important as those tasks may be! Perhaps more importantly, rotas are an opportunity to invite people deeper into the church's community and into discipleship. 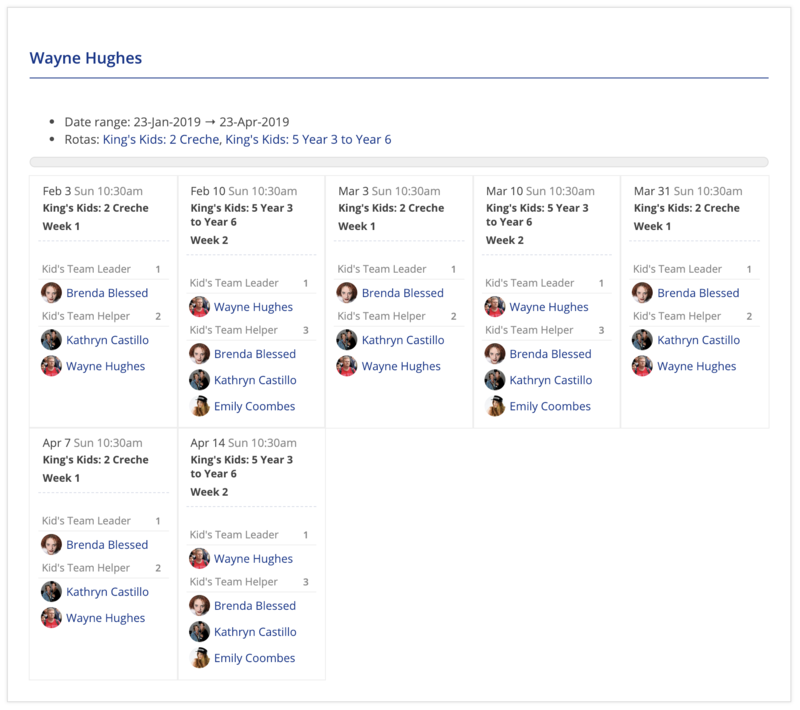 Serving in teams alongside the same group of people on a rota with consistency is a great way to foster team member relationships and build an environment within which discipleship and spiritual growth can be nurtured. That's not of course to say that people won't sometimes need to schedule unavailability! But how do we maximise those opportunities for community and discipleship without over-stretching our serving teams? How do we identify those at risk of "serving fatigue", or those who are not being best-utilised within a ministry? The answers to these question are complex and will differ from ministry to ministry and person to person - however, ChurchSuite includes some great tools to help you understand your Rotas module data better; to drill down into each rota's statistics to see the serving frequency of rota members, and to drill out and see the "bigger picture" personal serving commitments of your serving members. The Statistics page of each rota gives a helpful breakdown of people serving within the rota for the range of rota dates being viewed - use the View filter to change the results period, perhaps to view the entire rota. The statistics page begins with a statistical breakdown of the rota - the number of members serving on the rota, the number of rota dates, the number of serving instances (calculated as the number of people deployed in various roles across all the rota dates) and the number of ministry members not serving on the rota. Scrolling down the Statistics page further, the personal serving statistics of each rota member is listed. 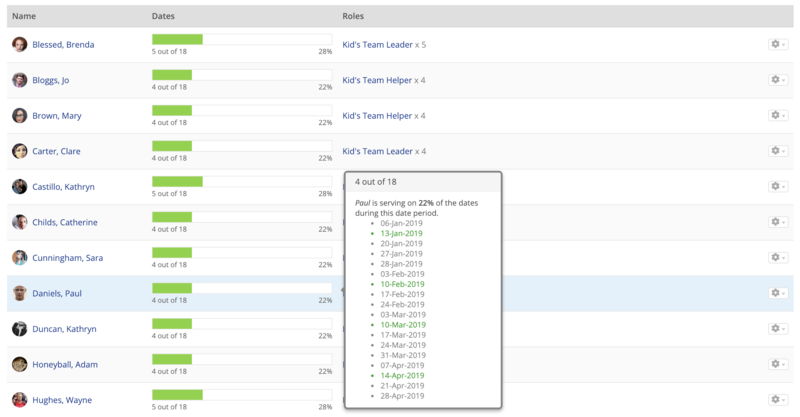 Hover your mouse over a rota member's green serving indicator bar to see a "pull out" of the specific serving dates of that member - shown in green. The list shows the various roles being fulfilled by each member. Click the column headings to re-order the list by either Name or Dates. Ordering by Dates allows you to more easily see who's serving the most (and least!) within the filtered view period for that rota - ideal for identifying those who are the most invested in your ministry, or those who may be in danger of serving fatigue. After the rota member list is a list of ministry members Not Serving in the filtered rota date range. These might be your reserves or "resting" ministry members, or people who for whatever reason have not been deployed to the rota yet. These may also be possible candidates to approach if you have a gap on the rota that needs filling! ...you can drill out to see that person's Personal Serving across all their rotas within the range of dates being filtered. As introduced in the last section, it's possible to view a Personal Serving report for each rota member - this can be viewed for a single rota member, accessed from the rota member cog action menu on the Statistics page or the Dates page of a rota. 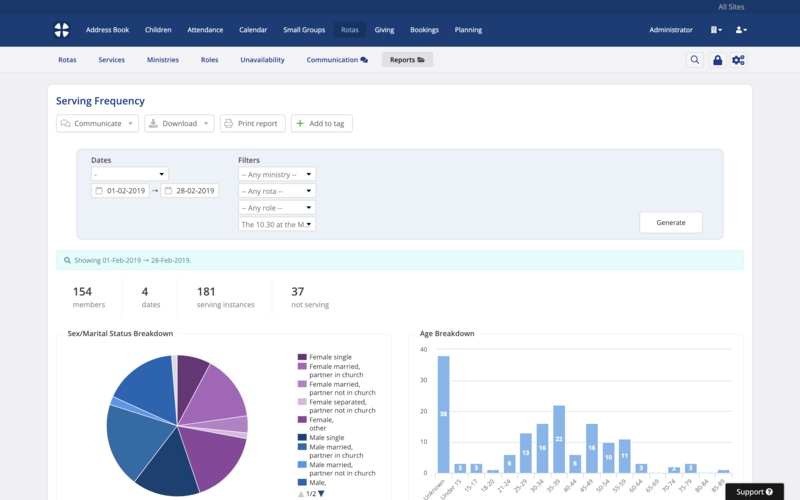 However, there's also a Personal Serving report in the Rotas module's reports section, which can be used to report on the personal serving of all rota members. This report can be filtered by serving Day and within a range of rota Dates for a selection of ministries, rotas and roles, ordering each rota in the results by Name or Role. Click Generate to apply filter changes and see the matching results. 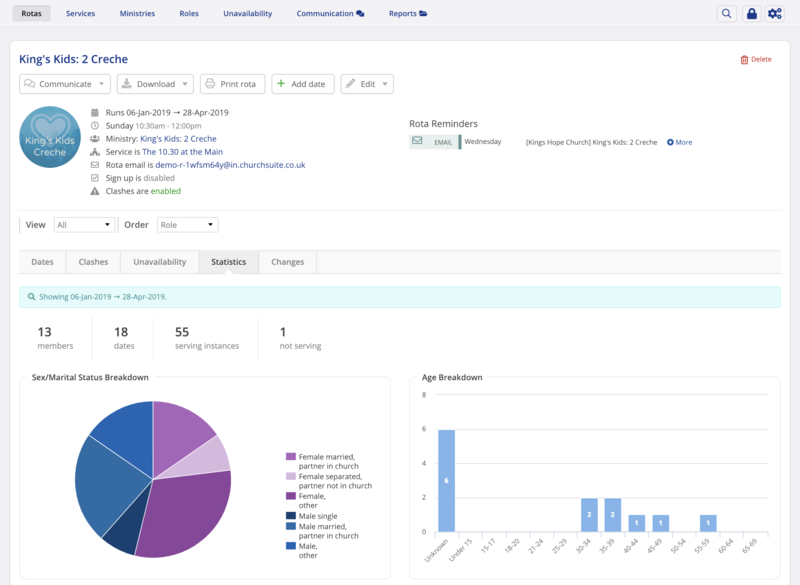 Like the Personal Serving report, the Serving Frequency report allows you to see the statistics and serving frequency across multiple, or even all rotas. This report can be filtered by serving Day and within a range of rota Dates for a selection of ministries, rotas, roles and services. Click Generate to apply filter changes and see the matching results. The top section of the report gives a summary of serving within the reported rotas - the number of members serving on the rotas, the number of dates, the number of serving instances (calculated as the number of people deployed in various roles across all the reported rotas and dates) and the number of ministry members not serving on the rotas. Scrolling down the report, the serving frequency statistics of each rota member are listed. Hover your mouse over a rota member's green serving indicator bar to see a "pull out" of the specific serving dates of that member. The list also shows the various roles being fulfilled by each member. After the rota member list is a list of ministry members not serving on the selected rotas within the filtered rota date range. Note that this report differs from the Not on a Rota report, which is designed to list all Address Book contacts not serving, whereas this report section lists ministry members not serving.